For this post, I wanted to take the data analysis process in a different direction. Normally, an R analysis starts with data from a comma-separated Excel file (.csv) or a tab-separated file (.txt). This data is LA city revenue, broken down by fiscal month and department. I want to get the total monthly revenue for the entire city and looks for seasonal trends. To do this, we need to load in our JSON file, manipulate it, and apply time series analysis. Let’s get started. We load in the JSON file just as we would any other file type. However, R cannot read it, and that’s where “rjson” package comes into play. Once we extract the JSON file, we obtain the observations in the data section and create a variable for the number of observations. As I mentioned, let’s looks at the observations data, which is in arrays but can be manipulated like a matrix. We first create arrays to store the values, then loop over the arrays to get each value by its index. In JSON, we first get to the correct observation with the [[x]] parameter, then choose the value within the vector with the  parameter. We now have arrays for the fiscal year, month, department, revenue, and fiscal period. First we need to combine our vectors into a data frame to combine monthly revenue. With our dataframe ready, it would be great to have some pivot table style manipulation to get monthly totals, right? Well, the plyr package and ddply command come to the rescue. To do a very simple seasonal analysis, we can use the “forecast” package. The stl command allows us to see an underlying trend, a seasonal adjustment, and a residual error. 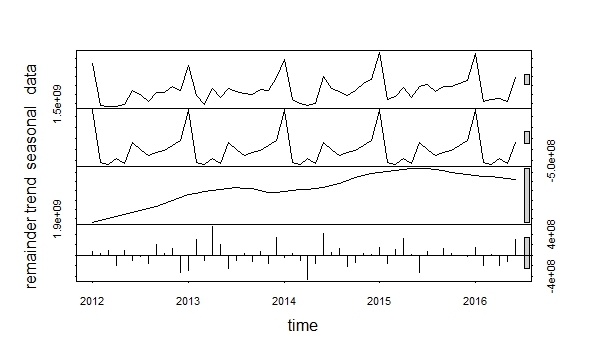 I’ll plot just my time series data with seasonal model (fit). Hope this tutorial has encouraged you to play around with new sources of data.